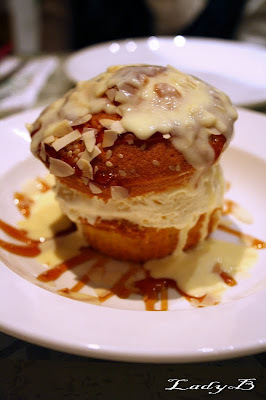 Gers Oqailey Cupcake, vanilla ice cream centre, white chocolate sauce on top and garnished with caramel sauce and almond chips ! Normally, I classify food into two groups!! "Awesome", and "not as awesome"..
and I can't really classify this one yet..
Super awesome indulgence, not so awesome while fasting..!! I was stuffed and just wanted to take a bite, but I couldn't stop ! it is amazing! i'm to afraid to go back to cafe bazza because i ate so much the first time i went!